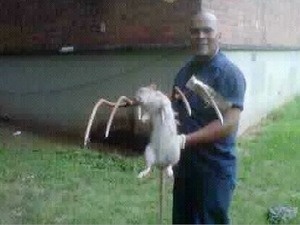 Taken at the Marcy House projects in Brooklyn last week this photo apparently shows housing worker Jose Rivera holding a three-foot rat he killed at the end of a pitch fork.Rivera told The Daily News he hit the rodent once and it kept moving, but he struck it again and it died. “I’m not scared of rats,” he said, “but I was scared of being bitten.”�Rivera was filling a rat hole when three came running up at him, but he managed to kill only one. Posted on 08.30.11	to articles. Subscribe to follow comments on this post. One comment. Add your thoughts or trackback from your own site.